A game unlike any you’ve played elsewhere. Honor and service are valued more than magic swords taken from wandering ogres. Prepare for the glorious life of the samurai! Play from the Character Sheet. Legend of the Five Rings rules have never been more easy to learn and to play. No more need to flip through pages of rules while fighting your enemies! A toolbox approach to role-playing in Rokugan. Fourth Edition encourages gamemasters of Legend of the Five Rings to customize their game, adding or removing from their campaigns as they see fit, customizing the game to fit their story lines and players. A broad history of the Emerald Empire and thebeliefs of all the Great Clans, with play options not only the major clans but also for outlying groups such as Imperials, Minor Clans, and the infamous Spider Clan. This is the first edition of the L5R Tabletop that I’ve played, so I can’t compare and contrast this update with the earlier versions, but it’s not my first RPG ever by any means, so I’ll give my impressions on the game systems and give an overview. L5R 4th-ed is a table-top role playing game set in the fantasy feudal japan themed land of Rokugan. you create a character who was trained to fight(samurai, ninja, berserker, etc. ), perform magic(Shugenja), or represent your clan in politics(courtier or magistrate). But these are just the three main ways to gear your character. There are many ways to subtly combine and change the styles of play through skills and advantages, which is one reason I like this game. Skills are action based, meaning they relate to how well you can perform what you want to do, from fighting with a katana, to sweet-talking (or black-mailing) an opposing clan’s magistrate into some beneficial concessions for you or your clan. Advantages are usually purchased at creation and usually improve rolls or traits (STR, DEX, INT, etc) or give static bonuses. You may also purchase some disadvantages, which give you extra starting experience points to spend in exchange for some kind of deficit (ex: deformity, phobia, or curse of a spiritual realm or specific deity) to your game play. The range is between one and seven points, with a one pointer being a missing finger or an upset spirit, to a seven or maybe eight pointer being a curse from a deity or an entire spiritual realm. The character creation and gameplay have a learning curve, like every RPG of this kind, but it’s not too steep for a beginner (though if you’ve never played an RPG, the initial learning curve is pretty steep regardless). All in all I enjoyed this game very much. It uses a D10 (10-sided dice) system, and turns and combat move quickly. I’m a fan of little or no down time, and thankfully this game doesn’t suffer too much from combat crawl. If you’re a fan of Samurai, Ninjas, or RPGs; you should check this game out. Also give some of the expansion books a go, as they flesh out aspects introduced in the core book, and usually have pre-made campaigns and characters to get you and your playgroup started. 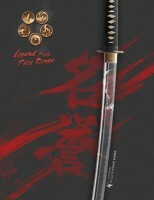 Add a Review for "Legend of the Five Rings RPG: 4ed Core Book"